Amba Heat Ltd, in association with their sister company Birmingham Air Conditioning Ltd. can provide the complete solution to your heating, cooling and air conditioning requirements. Whether you require a bespoke high specification unit for Pharmaceutical, Health care or manufacturing facilities, or a commercial air handling unit to give a cost effective, engineering solution to a particular process requirement, or even the need to retro fit an air handling unit into an area with limited access and space, we have the unit design expertise and engineers you are seeking. The company has a long history (established over 25 years) of providing quality equipment to meet demanding criterion for all manner of applications, from the nuclear industry to office heating. Standard units are constructed from an aluminium Pentapost framework, with pressure die cast corner pieces, having single, 25mm, or 50mm double skinned, insulated panels, with a choice of infill materials to provide a range of thermal and acoustic properties, this provides a lightweight but robust casework. The panels can be constructed from stainless steel, galvanised steel, plastisol or a number of other materials to suit the requirement. The units are supplied either in one piece or in modular format for bolting together on site, dependant on client requirements. All sections being mounted on a welded channel iron base frame to provide rigidity for off loading and positioning purposes. 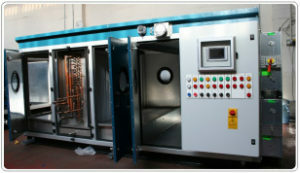 The units can be fitted with a variety of equipment and heat recovery devices, tailor made and selected to provide the client with the most cost effective solution to suit their requirements, which can range from close control air conditioning with humidification for standards laboratories and archives to basic warm air systems for office or space heating. 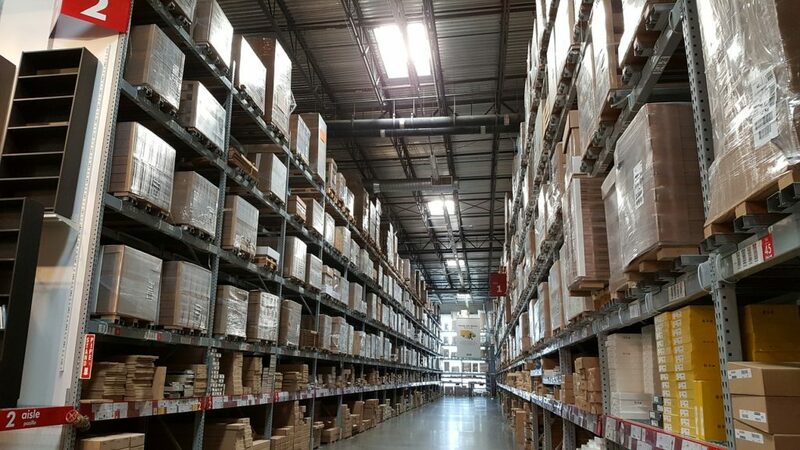 All our air handling units are suitable to be supplied in 'knock down' format, which makes them an ideal choice for either retro-fitting in existing buildings where access through corridors or doorways would normally prohibit the installation of a new air handling unit, or in instances where the use of heavy lifting equipment to lift the complete units, would prove either impossible or prohibitively expensive. • Each unit can be fitted with a selection of the following, to provide the ideal solution to your requirement. • Forward or backward curved belt and pulley driven fans. • Mixed flow or plug fans. • Drive motors with a full range of temperature and drip proof ratings. • Efficiency one drive motors. • Stainless steel or galvanised steel, washable, impingement filters. • Carbon filters in a variety of grades to absorb differing chemicals. • Low Efficiency Particulate Arrestors (LEPA) filters. • High Efficiency Particulate Arrestors (HEPA) filters to H13, U15 grade. • All filters with galvanised or stainless steel, sealed frameworks. • Bare copper heat exchanger coils. • Cooper heat exchange coils with aluminium or copper fins. • Stainless steel or galvanised coil casings with or without drain pans. • Stainless steel heat exchange coils. • Multi circuit refrigeration coils, to suit all refrigerants. • Direct expansion cooling coils, condensing units and refrigerant pipe work. • Indirect gas fired heaters. • Direct gas fired heaters. • Electric heaters with thyristor control. 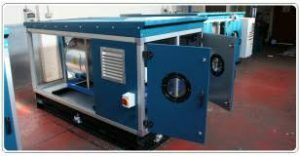 • Plate type, air-to-air heat exchangers manufactured in aluminium, recycled or food grade plastic. 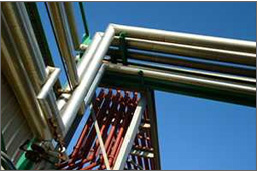 • Heat pump heat exchangers. • Run around coils. Heat pipes. • Electrode steam humidity generators. • Direct steam injection humidifiers. • Spray humidifiers with legionella protection. • Ultrasonic, 'cold mist' humidifiers. • Multiple nozzles, short absorption distance steam humidifier. • Control panels and three port valves etc, to provide fully automatic control of the systems. • Carbon monoxide and dioxide detection. 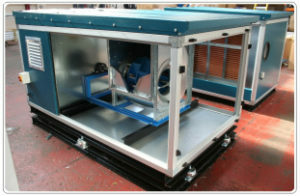 In addition our air handling unit site erection teams, have extensive experience in the re-conditioning of air handling units, and have carried out many installations from simple cleaning and disinfecting units, to the complete refurbishment of units including the replacement of panels, heating and cooling coils, fan bearings, humidifiers, etc, in existing plant rooms where access is restricted. For further information please call 01543 878772 or complete our contact us form.